[page 20] We will continue to use the "is" in stating metaphors like MORE IS UP, but the IS should be viewed as a shorthand for some set of experiences on which the metaphor is based and in terms of which we understand it. I had underlined it back in 1984 as indication of a non-E-Prime writing, where E´ is Samuel Bois's name for writing that excludes the use of the verb "to be" as a technique for increasing clarity. To say, "She is a criminal" is less useful than to say, "She shoplifted a bra." The stark identification and stereotyping from using "is" can be avoided by the assiduous use of E´ techniques to great effect. The problem with using "is" is just the unspecified nature of the experiences expressed. It is a way of concealing from others and oneself what meaning is intended because everyone has a unique set of experiences on which to understand another's words. What Johnson does above is explain his use of the simple verb "is" as a shorthand for some set of unspecified experiences in the metaphor MORE IS UP. 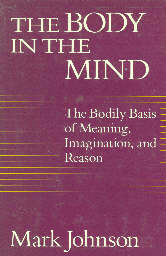 What brought me to Johnson's latest book, The Mind in the Body, were two things: 1) my current research in the nascent science of doyletics and 2) the subtitle which reads: "The Bodily Basis of Meaning, Imagination, and Reason." If meaning, imagination, and reason have a bodily basis, that basis must be doylic in nature, that is, the stored physical body states (doyles) from one's pre-five-year-old personal experiences must form the basis for how we think and reason! We understand MORE IS UP because we each have some doyle of experiencing UP: when we are under five, almost everyone is taller than we are and we have to look to see them. The doyles associated with looking up are stored as full body experiences or doyles, and later in life when we think UP, those doyles of UP will triggered and those doyles form the very basis for our understanding of the meaning of UP. We grow UP, that is, we become MORE as we grow bigger. We are vertical and erect beings, and we, from the perspective of our head, go UP as we grow. That leads us to our understanding of MORE IS UP. To a horizontally arranged animal, such as a snake, the concept of MORE IS UP would have little meaning. Doyle Henderson in his pioneering work established the basis for all feelings and emotions being due to stored physical body states (doyles) from before five. What Johnson's work has brought home to me is that our very basis for understanding the meaning of the words we speak to one another stems from the idiosyncratic doyles we have stored in our individual bodies before five years old. This hypothesis is equally true for each of us, no matter what language we speak or country we live in. How this storage of early childhood physical body states or doyles impacts what we currently know as memory, understanding, and consciousness is dealt with in my two recent reviews: Strange, Familiar, and Forgotten and The Mystery of Consciousness. In this review I will deal with how these doyles provide the foundation of what we mean and understand by the words meaning and understanding. And all this is thanks to the fine work of Mark Johnson on the bodily basis of meaning, imagination, and reason itself. It is clear to me, even at this early stage of the development of the theory and science of doyletics, that the insights it provides into the nature of consciousness will place its importance on a par with that of its sister science, genetics, by the middle of the 21st Century. The field of robotics and androids will require an intimate knowledge of doyletics in order to create androids that have the appearance of humanity. How is an android to understand such a simple concept as MORE IS UP unless it has the capability of storing doyles during its early startup training? And storing doyles means the android must have bodily sensors whose state can be recorded and stored into a fast cache for instant later recall so that when it hears the word UP, its eyes automatically move upward or tend to (the servos begin to move and are stopped). Does Data, the android on the Starship Enterprise want to experience feelings? He will need to become as a child again, have all the multi-phasic experiences of learning the world anew, all the while his doylic cache will be storing the sensor settings of each bodily experience. Once through this training period, when a novel event happens to Data that triggers a remembered experience he had during the training period, he will react appropriately. He will smile when something nice happens because he smiled during the training period. And we as humans will begin to understand the wonderful functioning of our own bodies that provides spring training for us to learn in June the experiences we will require in December. As James M. Barrie, the author of Peter Pan, wrote, "God gave us memories so that we may have roses in December." What if an android so programmed wished later to modify its programming and to flush from its doylic cache some feeling that was inappropriate for its current job function. Perhaps it's a backing away reaction during its approach to the side of a cliff, what we humans call acrophobia. How is the android going do its job unless it has some way to remove this inappropriate behavior? One that could endanger the mountain climbing mission it is assigned to. The doylic cache can be flushed by the android in the following way: Let call the android Emotia and make it a female for convenience. What Emotia does is this: with the bodily states of her servos attempting to back her away from the edge of the cliff where she was expected to go, she recognizes a problem due to a conflict between her "natural" responses and her duty. She decides to do a doyle trace as she was taught during the doyletics training session. She begins to track back in time until her doylic cache reaches the exact spot of a signal to activate her servos to back away from high places. She came by it honestly from her Android Trainer, Domestico, who was a valet and was taught to avoid going near open windows in high buildings. When she reaches the servo activation point, she sets it to bypass, and immediately thereafter, Emotia can then walk confidently along the cliff trail. This fanciful android story illustrates what happens when a human being wishes to remove an unwanted doyle. The signal that the human has gone past the original event comes when the doyle disappears. The doyle disappears at that time because it is converted from doylic memory into a cognitive memory - the bypass is set from now on. In the UPN series, Startrek Voyager, Katherine Janeway said, "Someone once said that 'All invention is but the extension of the body of man'." First meaning, understanding, and reason and then invention - all these proceed from the body of man. I have for many years held the thought that any invention simply provides a way for others to do what the inventor already knew how to do without the externalized form of the invention. Janeway's comment supports my understanding on the matter. In the previous paragraph I explained how one would go about creating a thinking and feeling android using my own sense of how doyles are stored and re-triggered in my own body. [page ix] Without imagination, nothing in the world could be meaningful. Without imagination, we could never make sense of our experience. Without imagination, we could never reason toward knowledge of reality. . . It is a shocking fact that none of the theories of meaning and rationality dominant today offer any serious treatment of imagination. Johnson then proceeds to tackle those so-called theories of meaning, particularly the Objectivist viewpoint, and holds them scoreless, to use a football metaphor. Surely you're joking, Mr. Johnson, we might say when we hear that he is planning to propose metaphors, those "deviant linguistic expressions" (page xii), as the basis for a new understanding of the entire process of meaning. And yet, that is exactly what he attempts and in my opinion, does so in an admirable and comprehensive fashion during the course of this book. He tackles once again the Objectivist view of meaning, this time from several fronts: categorization, framing of concepts, metaphor, polysemy, historical semantic change, non-Western conceptual systems, and growth of knowledge, and says that "the studies in any one of these areas are sufficient to radically question Objectivist views of meaning and rationality. Taken together, they are overwhelming." [page xiii] . . . this vast network of related empirical studies, in conjunction with the logical argument voiced by Putnam, points to one fundamental moral: any adequate account of meaning and rationality must give a central place to embodied and imaginative structures of understanding by which we grasp the world. And that is exactly the opposite of what Objectivists do. Rather than a central place for these imaginative structures, they call them mere "psychological" processes and claim that while they have a place in the context of discovery, they have little to do in the context of justification, "in which we reconstruct the logical relations of theory in order to show its grounding and certitude." (page xxiv) Not only do the major semantic theories not give these structures a central place, they don't even mention them, Johnson points out. [page 3] 6. A proposition exists as a continuous, analog pattern of experience or understanding, with sufficient internal structure to permit inferences. The act of writing is the conversion of propositions into coherent sentences and meaning, it occurs to me. I note how the writing of the sixth account converts the sixth to the other five. In other words, account six (6.) as it is written in the [page 3] quote above is all of the following: a statement, a symbol representation, a state of affairs in the world, relates the world to a truth value, and represents elements and links them to each other. Tough wading through this miasma of words, I'll grant, so let's take a look at the non-propositional side while everyone takes a deep breath of relief. [page 4] To cite a simple example, my present sense of being balanced upright in space at this moment is surely a nonpropositional awareness that I have, even though all my efforts to communicate its reality to you will involve propositional structures. So, while we must use propositional language to describe these dimensions of experience and understanding, we must not mistake our mode of description for the things described. [page 5] I am perfectly happy with talk of the conceptual/propositional content of an utterance, but only insofar as we are aware that this propositional content is possible only by virtue of a complex web of nonpropositional schematic structures that emerge from our bodily experience. [page 11] This observation misses the point. We are concerned here with how real human beings reason and what real human beings grasp as meaningful. In order to be able to understand the passage, we, the readers, must be reasoning that way, too. How do we learn to experience forces, he asks, and points out that it begins in our childhood as we pull objects towards us, raise a bottle to our mouth, and pull our bodies up into space when we first learn to stand up. Sometimes we are successful and smile, other times we are unsuccessful and frustrated. All of these experiences get stored as doyles that are later available to help us both understand and communicate the meaning of force. Our bodily experiences or doyles are idiosyncratic, dependent upon the set of experiences we undergo in our culture before we reach the age of five and the storage of doyles cease. But given that in a given culture individuals are subjected to very similar experiences before five, we all have common bodily experiences upon which to base our understanding and meanings. Once we reach five-years-old, each time we attempt to communicate or make sense of another's communication, the images, tones, gestures, and words of their communication to us trigger pre-five-year-old doyles which enable us to understand their communication in our bodies. If we learn about force before five, it is force by immediate contact with our bodies at first and then later of force exerted by objects that we are grasping in our hands. "One day we find ourselves grappling with the dizzying notion of force at a distance," Johnson says on page 13 (my italics). How can a notion become dizzying except by the intervention of doylic responses in our body? Our metaphors betray the very structure of our bodies extending all the way up into the limbic-root brain region (responsible for doyles) and the neocortex (responsible for conceptual memories) with its highest cortical functions. The author stresses that PHYSICAL APPEARANCE IS A PHYSICAL FORCE is more than "a conceptual nugget or a set of associated propositions." [page 14] It includes also the sense of force that we gain through interactions of the sort described above. I use the term "sense" here to indicate that meaning includes patterns of embodied experience and preconceptual structures of our sensibility (i.e., our mode of perception, of orienting ourselves, and of interacting with other objects, events or persons). Let us examine the adjective preconceptual - what can it possibly mean if not "before conceptualization is possible"? What are the preconceptual structures of our sensibility if not the set of physical body states or doyles stored in the limbic-root brain structures of our mind? This root brain region, especially the two almond-shaped structures called the amygdala, existed before our neocortex was fully developed and therefore these structures had the full responsibility for providing "structures of our sensibility" that were literally preconceptual - these functions existed and allowed our early ancestors to live and thrive long before they ever knew what a conceptual memory was! They had "memories" - but these were vague, diffuse memories stored in the amygdala that provided quick reaction responses to danger and kept them alive in their very dangerous circadian world. From these ancestors we inherited our marvelous ability to store these physical body states as bodily memories, but we added a function on top of that which provides us with the ability to have clear conceptual memories with a range of visual and hearing detail that they were not capable of. With our doylic memory capability we achieve a capability of memory by age five that our Neanderthal ancestors only reached at maturity. With our conceptual memory capability we achieve a memory capability by age ten that our Cro-Magnon ancestors only reached at maturity. Looked at evolutionarily, we humans today ontogenetically achieve a memory capability at age five that our Neanderthal ancestors phylogenetically reached at maturity. Ontogenetically we achieve a memory capability at age ten that our Cro-Magnon ancestors phylogenetically reached at maturity. Simply put, from age five to age ten a human child today moves from the level of capability of an adult Neanderthal to an adult Cro-Magnon human being! As we raise a child from birth we are in a position to observe the evolution of mankind before our eyes, rightly understood, confirming the insight of Fritz Müller who formulated the biogenetic fundamental law, which can be stated briefly as the teaching that "in its development from the egg to adult stage, the animal tends to pass through a series of stages which recapitulate the stages through which its ancestry passed in the development of the species from a primitive form." In other words, the development of the individual is a condensed expression of the development of the race. In condensed form, this insight is expressed as "ontogeny recapitulates phylogeny." What does it mean to us as humans that at age five our neocortex reaches full operating potential? It means that all novel experiences we have are no longer stored as doyles, as bodily sensory experiences in the limbic region of our brain, but rather they are subsequently and for the rest of our lives stored only as conceptual memories in the neocortex. Ah, but how can the memory of something cause us to feel the way we felt at the time? What happens is that the amygdala shortstops the signal, matches it with a doylic memory in its storage, and sends to the hypothalamus a set of the signals that were stored during the original doylic event. These signals activate the parasympathetic nervous system, pain sensors, pressure sensors, and every part of our body that was affected during that original event. It is as if we are transported in time back to when we were four, for example, and that big Labrador dog from next door got loose and broke into our garage and ate our cat's new kittens. We bawled and cried at the time till our eyes were red and puffy and we had trouble breathing. During our time warp transport by the amygdala-limbic system our eyes become red and puffy and we have trouble breathing. Only problem is we don't remember the original event as a conceptual memory because we had no conceptual memory capability fully functioning at the time! So what do we do? Like anyone who knows about allergies would do, we say, "I have a dog allergy." And we go to the doctor for some medicine. The amygdala, while intercepting the signal, does not stop it from reaching the neocortex where the higher cortical functions process it, but the cortical processing does not even begin until the amygdala has already triggered a response in the hypothalamus. It is as if the amygdala is a teenager and the neocortex is his grandfather. They are both sitting on the porch and the newspaper boy rides by and throws the daily paper on the lawn. The teenager hops off the porch and has the paper in his hand before the grandfather can warn him that the sprinkler system was on. Both receive the message, but the one with the faster, albeit unthinking, reflexes takes action before the other one can suggest a wiser course of action such as turning off the sprinklers first. If we know about doyletics and how to do a speed trace, we do like the android above was taught to do to remove unwanted responses to his walking alongside a cliff. Same exact procedure will work here. We have the doyles present in us in the form of the red, puffy eyes and difficulty breathing. We say, "I'm 41 and experiencing this doyle." Then we go back in steps like: 30, 20, 10, 5. At five we will still be experiencing the doyle and are set to go before when the original event may have happened. We won't know when until we find out by the doyle disappearing. We say, "I'm 4 - am I experiencing the doyle?" If no, we're done; if not, we go on to 3, 2, 1day after birth, 1 day before birth, 1 month before birth all the way to 7 months before birth. Somewhere along the way the doyle will disappear and we'll know it immediately because our breathing will become normal instantly. If this sounds implausible, like a fantasy, I assure you that it's not, it actually happened and is reported in the doyletics website at: http://doyletics.com/redwag2.htm#dog_allergy. When she recovered the original event, she remembered the Labrador. Then it dawned on her that the dog that triggered the allergy was a Labrador. That explained why she had owned dogs before and never got a dog allergy from them. Unconsciously or preconceptually as Johnson would say, she had avoided Labradors. A one-minute speed trace and her dog allergy was gone forever, never to return. The next time she is in the presence of a Labrador, she will remember that a dog like that killed her kittens, but no doyles of her previous allergic reaction will ever return. [page 14] These embodied patterns do not remain private or peculiar to the person who experiences them. Our community helps us interpret and codify many of our felt patterns. They become shared cultural modes of experience and help to determine the nature of our meaningful, coherent understanding of our "world." It is a powerful statement albeit an overstatement that Johnson makes when he claims that embodied patterns do not remain private to the person who experiences them. From our thumbnail analysis of human development above we have shown that embodied patterns are stored by individual humans in their own amygdala-limbic structures. These are necessarily private and not shared by a community. But there is a sense in which Johnson is correct because these private experiences, once triggered, are displayed to everyone around us at the time. In this way they become public. In doyletics we study the acquisition and transmission of doyles, not only the structures in the brain that store them, but also the processes by which doyles are acquired from other people. The easiest doylic transmission to think about is the mother and the child under five. The mother sees a roach crawl across the floor and screams. The child jumps and her skin crawls as she sees the roach her mother called attention to. The child, with her vivid imagination, imagines the roach crawling over her skin. She has earlier in her young life felt something move on her skin as she imagines the roach is now, so that doyle has already been stored and it is that same doyle that is triggered as her mother screams. The whole complex of the roach on the floor, her bodily experience of jumping in fright, and the crawling doyle over her skin are stored as an original event. As an adult 10, 20, 30, 40, 50, 60 years later, whenever she sees a roach she will jump and feel the crawling sensation immediately. It will happen before she knows it! Remember that the hypothalamus, like the teenager in the metaphor, gets the signal before the neocortex, and has triggered a reaction before she's able to think, "Oh, it's just a roach. I didn't have to act that way!" Doyles are at the root cause of most irrational reactions that people have, rightly understood. Some of you may be thinking, "Oh, that's silly! Fearful of roaches for a lifetime? That's balderdash! I was afraid once, but I haven't been afraid of them now for a long time!" In those cases, just like in food dislikes that disappear as we grow older, the roach fear was removed during an unconscious doyle trace. Look at what has transpired. A child will ignore or even play with a roach unless taught otherwise. I'm not talking about some didactic lesson about roaches, but the kind of lesson that the mother above unknowingly and unwillingly gave her child. She transmitted, in effect, her doyles of fear of roaches to her receptive child. The acquisition and transmission of doyles are via parents, siblings, friends, caregivers, and other associates of a child before they reach the age of five. What's important here is note that not everyone is afraid of roaches, spiders, or snakes! This one easily observed fact undermines Johnson's statement that we have shared cultural experiences. If we did, everyone would have the same allergies, the same phobias, etc, which is simply not true. Now let us look at this interesting statement from the page 14 quote above, "Our community helps us interpret and codify many of our felt patterns." What happens when we have a fear of roaches in the front of our fearful mother, she helps us interpret it as a natural pattern, an appropriate response to roaches since it matches her own. But sooner or later we leave home and encounter a roach at a friend's house, and their mother calmly takes a fly swatter and smashes it with a smile. "Wow!" we say aloud. The friend's mother explains to us that the roach is nothing to be afraid of. Suppose we're at age 7, let's say, and we think back to all the roaches we've encountered, we go back before the original event while holding the doyle of roach fear, and BANG! Suddenly, our roach fear is gone! And exactly like after a doyle trace, once the fear of roaches is gone, it never returns. Our community in the form of our friend's mother has helped us to interpret and codify our felt patterns, and oh, by the way, we lucked into an unconscious doyle trace and removed the fear. That removal of the fear does not happen every time, unless you consciously apply the principles of doyletics, but it happens often enough that people will continue to try. If it seems to you that much of what passes for psychotherapy involves just such an interpretation and codification of our felt patterns, well, it did so for me as well, which is why I am able to explain this just now. If we have any doubts remaining that Johnson's preconceptual dimensions of meaning are doyles, the following passage should remove them. [page 14] We are not talking about an emotional overlay on, or response to, some core concept of sexuality but rather about bodily and imaginative structures of attitude, rhythm, pattern of interaction, sense of pressure, and so forth, that are constitutive of sexual force. The items he gives are each and every one of them a physical body state, each of which, remembered from before age five, constitutes what we call a doyle. Thus doyles are preconceptual dimensions of meaning. They are idiosyncratic to the individual's personal history, but come to have communal or shared characteristics due to the acquisition and transmission of doyles between the child and its associates that occur before the age of five. [page 29] The view I am proposing is this: in order for us to have meaningful, connected experiences that we can comprehend and reason about, there must be pattern and order to our actions, perceptions, and conceptions. A schema is a recurrent pattern, shape, and regularity in, or of, these ongoing ordering activities. These patterns emerge as meaningful structures for us chiefly at the level of our bodily movements though space, our manipulation of objects. and our perceptual interactions. One of the interesting aspects of working crossword puzzles is the long words that have similar definitions to them. You do one STRIKEABARGAIN and you notice the possibility of a pattern. You do the second one PUNCHTHECLOCK and you notice that each one involves a forceful motion of contacting an object. That makes the third one much easier HITTHEBULLSEYE. These exact words came up one day as I was reading this book on page 29 and I suddenly realized that what constitutes the global clue, the pattern of the three phrases, is in fact an image schema exactly like Johnson defined above. There was a recurrent pattern, a regularity in the three activities which the puzzle writer had laid down for us as a meta-clue to the heart of the puzzle. 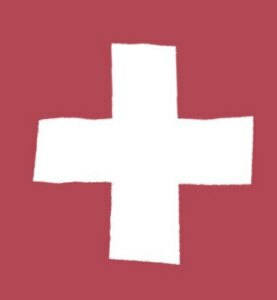 Sometimes these image schemata are called the theme of this puzzle and will appear as a clue to be solved in the puzzle. About that same time I was visiting my daughter's house and noticed that whenever it came time for her daughter to do something, she always asked my grand-daughter if she wanted to do it. "Do you want to take a bath?" "Do you want to eat some cereal?" These questions did not always evoke immediate answers, and I mentioned to my daughter that when the child she is currently carrying is born, she won't have the luxury of asking and waiting for an answer to all these many questions before any operations are performed. She agreed. Great, I thought, now what does she do instead? Then it came to me as an image schema, IT'S TIME. Instead of asking if her daughter wanted to take a bath, eat cereal, or go to bed, she could make the simple statement, "It's time to take a bath." If she began that process now, she would increase the probability that when the baby arrives, she would not have to change her behavior suddenly from asking questions to abrupt commands, which is what it would otherwise seem like to the three-year-old child. That abrupt change is probably what leads to the well-known phenomenon of sibling rivalry. If a mother changes suddenly her means of dealing with a child when a sibling is born, the new child is blamed for the abrupt change of behavior of the mother and the older child takes it out on the younger child. In Chapter Four Metaphorical Projections of Image Schema Johnson tells us that Coleridge made a distinction between the synonymous nouns fancy and imagination thus: fancy is the process of concatenating "discrete images from perceptual memory" while imagination modifies the images "by a sort of fusion to force many into one." This corresponds exactly to eidetic imagery (fancy) and constructed imagery (imagination) - a distinction I first learned when I was studying the then nascent field of NLP with Bandler and Grinder. [page 69] Black drew attention to the metaphorical creativity issue with his provocative assertion that there is a class of metaphors for which "it would be more illuminating . . . to say that the metaphor creates the similarity than to say that it formulates some similarity antecedently existing." But Black, Johnson tells us on page 70, stopped short of "the radical claim that there are metaphorical projections on image-schematic structures." In the next passage Johnson tells us about our bodily experience of balance as an activity. One of the important component of a sense of balance is the proprioceptive sensors that tell us of the orientation and movement of the various parts of our body. My research has shown that proprioceptive doyles are clearly demonstrable (by virtue of being capable of being removed by a speed trace) in the phenomena of seasickness, vertigo, dizziness, acrophobia and many other balance-related syndromes that are otherwise not easily explainable. [page 74] The experience of balance is so pervasive and so absolutely basic for our coherent experience of our world, and for our survival in it, that we are seldom ever aware of its presence. We almost never reflect on the nature and meaning of balance, and yet without it our physical reality would be utterly chaotic, like the wildly spinning world of a very intoxicated person. The structure of balance is one of the key threads that holds our physical experience together as a relatively coherent and meaningful whole. And as we shall see shortly balance metaphorically interpreted also holds together several aspects of our understanding of our world. As for being solidly balanced in this world perhaps no stronger metaphor can be constructed than that of a building, and that's exactly the type of metaphor that is typically used when one is positing a new theory. One builds a foundation for the theory, gathers as much data to support it as possible, constructs hypotheses, performs experiments to shore up the theory, buttresses the theory with solid arguments so that it can withstand the howling winds of its critics without falling down. (from page 105) All these phrases suggest the image schema of THEORIES ARE BUILDINGS. Johnson says that it is not an "accident or a lucky coincidence" that we use these terms when we talk about our theories, "we do so because our cultural understanding of these realities is structured metaphorically." In Chapter Five, Johnson discusses Hans Selye's work on stress, how he first came to understand the reactions he was observing in the body by means of Walter B. Cannon's notion of homeostasis. "At last, the nonspecific reactions made sense as the body's attempt to maintain a steady state in the face of stress." (page 131) If the goal of the body is homeostasis, what can we expect to happen if at an age before five a response by the body is made to maintain a steady state and that response is stored as a doyle? Might we not expect that if that doyle is later triggered, the body will have a response activated in the absence of an imbalance of homeostasis which will in itself create another response by the body to restore homeostasis? The result will be what is commonly referred to variously as an allergic reaction, asthma, a rash, etc. If someone has their breathing cut off during a traumatic event before five years old, when some component of that original event occurs in their later life, they will re-experience the same cy cle of trauma, even though there is no external cause for the blockage of breathing. The very responses of their body to fight the doylic blockage can trigger an identical sequence of restricted breathing as in the original event. This is very similar to the case with the dog allergy mentioned above, except that the dog allergy came from breathing difficulty caused endogenously by extensive crying and asthma is usually caused exogenously or by externally applied restrictions of breathing due to smoke inhalation or externally restrictions of the breathing passages by otherwise well-meaning caregivers. One case I know of involved a dentist who pinched a child's nose to force his mouth open to perform dental work on him. The child grew up to be asthmatic. In Chapter Seven, "On the Nature of Meaning", Johnson once again tackles the Objectivist viewpoint and brings it down, this time for the count, a technical knockout in boxing terminology. [page 175] Grasping a meaning is an event of understanding. Meaning is not merely a fixed relation between sentences and objective reality, as Objectivism would have it. What we typically regard as fixed meanings are merely sedimented or stabilized structures that emerge as recurring patterns in our understanding. "Every word was once a metaphor," Emerson said. And as a metaphor the brand new word was created by a person who grasped a meaning and constructed an apt metaphor to communicate that meaning to others who could then share that meaning with each other. Over time and repetitive use, the word as metaphor lost its metaphoric aura and became just another word of our language. Take the word "paradigm" for example. It coasted along as a simple word meaning "model" as in the phrase "paradigm of virtue" until along came Tom Kuhn with his book, The Structure of Scientific Revolutions, and within decade or two the word paradigm has taken on a powerfully new and metaphoric meaning - it now refers to the embodied structure of an entire science that withstands the forces of change. From the simple meaning of an abstract airy-fairy model, it has grown under Kuhn's pen into a concrete-sided building that could withstand ideological earthquakes and tsunamis. [page 178] The key point for the theory of meaning I am advancing is that meaning always involves human understanding and intentionality. It is never merely an objective relation between symbolic representations and the world, just because there can be no such relation without human understanding to establish and mediate it. . . . The apparent transparency of understanding is really only the pervasiveness of shared understanding in ordinary experiences within stable contexts. [page 198] There lurks in most of us a gnawing fear that, should Objectivism prove untenable, the floodgates holding back the raging currents of relativism would be opened forever. We would all drown in the ensuing chaotic inundation. If I may be so bold as to offer an alternate metaphoric interpretation, I would say that we would all be full-immersion baptized in the unleashed waters and find our ultimate freedom of expression thereby. The less savory alternative is to continue to nibble on the menu (those sedimented or stabilized structures of flattened, once living metaphors) and complain about the food. [page 209] Understanding is an event - it is not merely a body of beliefs (though it includes our beliefs). It is the means by which we have a shared, relatively intelligible world. Understanding as an event or series of events expresses best why I chose the subtitle for my book, A Reader's Journal, to be "Journeys into Understanding." With each book I read, I undertake a journey into understanding. Journeys that take me into rain forests of new concepts, through deserts of dry prose punctuated by oases with freshets of sparkling clear meaning. In my journal I record the events of meaning and understanding of the intelligible world I have just journeyed through. This review is my journal entry of the exciting and fruitful journey through this book of embodied meanings by Mark Johnson. I began this review with the first sentence of the Preface and I now end it with the very last sentence of the book. [page 212] Objectivity does not require taking up God's perspective, which is impossible; rather, it requires taking up appropriately shared human perspectives that are tied to reality through our embodied imaginative understanding.